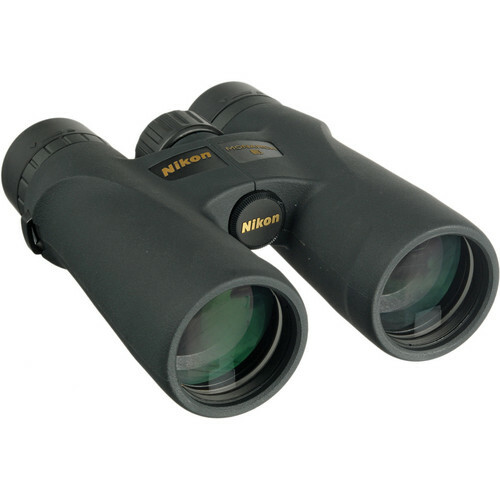 The black 8x42 Monarch 3 ATB Binocular from Nikon combines lead and arsenic-free Eco-Glass optics with a weather-sealed housing to create a general purpose optic that delivers image quality and reliability. Nikon’s All-Terrain Binocular (ATB) series delivers impressive brightness and contrast in a set of glasses that won't break the bank, making the Monarch series a favorite among naturalists and hobbyists alike. This 8x configuration of the Monarch 3 features a 9.8 ft close focus distance, equipping it for almost any close to mid-range observation. Highly-reflective silver-alloy prism coatings and phase-correction allow the Monarch 3 optics to render a bright image that is color-faithful and rich with detail. Additionally, Nikon uses twist-up eyecups that have multiple clip-stop positions and a generous 24.1mm eye relief to provide a comfortable viewing distance for almost any observer. 57 - 72 mm / 2.24 - 2.83"